This soup be like yummaayyyy. You can expect to see many-a-more bowl o’ Creamy Potato Kale Soup around our house in the next 10 or so years. Bjork (moderate liker of vegetables) and I (major liker of vegetables) both declared this a new favorite. For him, it’s the taste and texture. The taste is reminiscent of a very mellow broccoli cheese soup, and the texture? 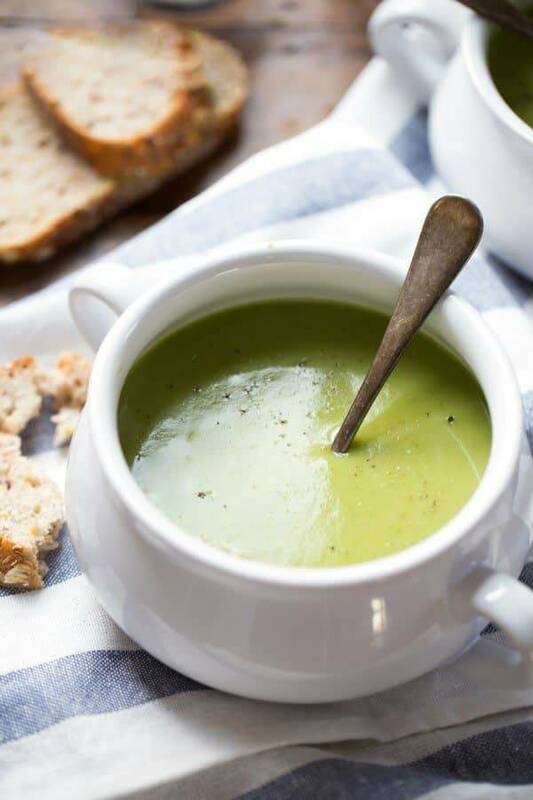 It’s seriously the creamiest, most velvety veggie-based soup you’ve ever spooned into your mouth or dipped your panini into. <— do it now. For me, it’s the velvety texture factor plus the fact that it’s really intuitive, extremely adaptable, and pantry ingredient friendly. If I remember right, there are 5 ingredients (two in a row! we’re on a roll!) and 4 of those ingredients are probably already in your kitchen as we type-speak. 1. 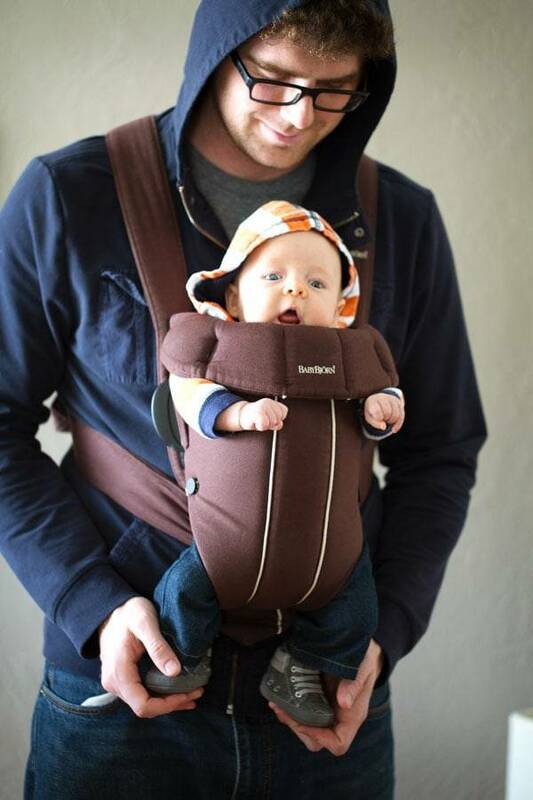 Those of you who have kids and continue to somehow defy all odds and make dinner happen? You have my major respect. This weekend we asked the question: How hard could it be to eat lunch when you’re babysitting the cutest of the cutesy nephew baby? Um, reality check. We had two adults to one 2-month-old and eating a warm meal together at the table, much less cooking in the first place, was virtually impossible. This was a picture I snapped of Bjork while I was making the soup, before we switched places after the frantic run to the kitchen for the bottle and the mad search through the diaper bag for the pacifier. And finally Bjork ends up at the table with a bowl of soup and I’m on the comfy chair doing some one-handed snacking instead. Because sometimes even Creamy Potato Soup isn’t worth waking up the baby. Now secondly, the elephant in the room, which is the COLOR of this soup. It’s beautiful in the artistical sense and completely scary in the more normal sense. I had to justify myself to people about 8 times in the work lunch room because I would get lots of What-Are-You-Eating glares. Or maybe that was my imagination and I just wanted to talk about food again? Either way. Seriously though, just eat it in a closet or something if you can’t get over the green soup judgement. This velvety dream is our new go-to for dipping with cheesy paninis, bread and hummus, and grilled cheese sandwiches. Bring on the kale! 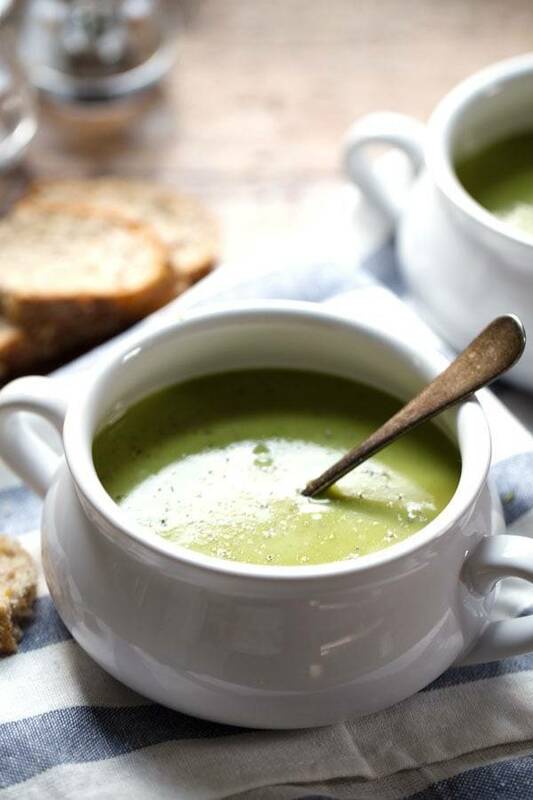 This Creamy Potato Kale Soup is beyond velvety! It’s our new favorite soup to pair with paninis, bread, and grilled cheese. Heat the butter in a large pot over medium high heat. Add the onions and potatoes and saute until golden brown, 5-8 minutes, sprinkling with salt and pepper. Add 6 cups of the broth and the kale; simmer for 5-10 minutes until the kale softens and becomes a darker green. Transfer the soup to a heavy-duty blender. Puree for 2-3 minutes or until the soup is completely smooth. Transfer the pureed soup back the pan and stir in the milk and the remaining 2 cups broth depending on how thick you want the soup to be. Season with salt and pepper and serve with yummy paninis, toasted wheat bread, or crackers, cheese, and hummus. 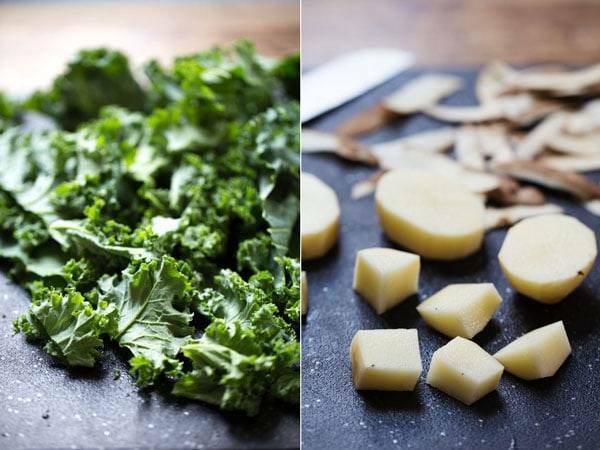 This recipe is very adaptable – add more herbs, use more potatoes, more kale, more broth, etc. Also note: the more kale you add, the more bright green your soup will be! Also, the longer you cook the onions and potatoes the more it “dulls” the flavor. You want them to be sauteed and golden, but not totally mushy. This is my first try at using kale in a vegetarian potato soup, and it turned out wonderful! I used my new immersion blender which worked very well for this creamy yummy creation. I used almond milk, garnished with chedder cheese, sour cream and chives which kicked it up a notch I’ve made a lot of split pea so the greenness wasn’t scary for my family. Thanks for the healthy yummy. Yummy! I did add 2 cloves of chopped garlic and substituted the milk with a can of coconut milk . Used my immersion blender to purée . 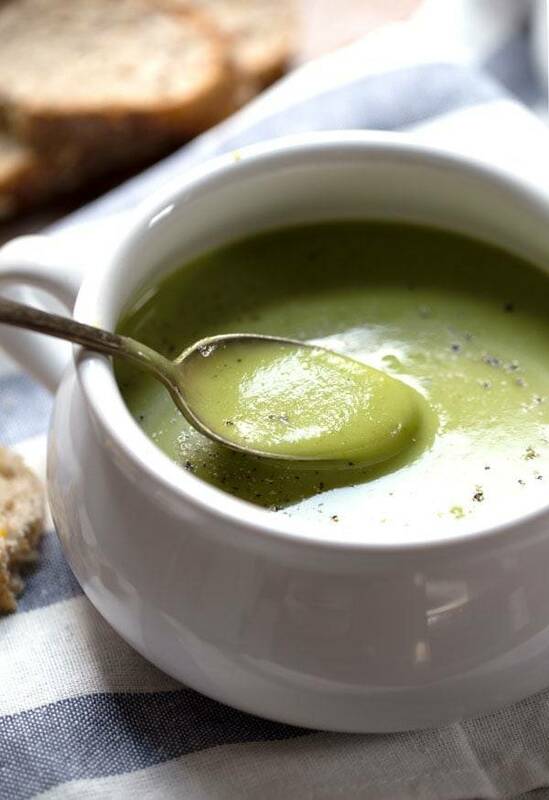 What an easy and delicious “green” soup. Versatile! I started with some bacon, crumbled it, deglazed the pan with some marsala wine (kind of weird but that’s what my hand grabbed), sauteed a leek and the potatoes, added the broth and the kale, blended it, added a touch of cream and three sage leaves and simmered it all for a few minutes. Served it with the crumbled bacon on top. Delicious. I halved the recipe, because it was just two of us. I also used half cream, half milk, but imagine milk would be just fine. We were looking for a simple, warm and light Christmas Eve meal, because tomorrow’s dinner will be big and heavy. This was fantastic. I never really did get a full puree on the kale, so there were flecks in the soup, but that was fine (and quite pretty, actually). I also used thyme, which I think really helped add a depth of flavor. The best part of this was the large, home-made croutons I happened to have. Those bites were just wonderful. That’s awesome! I’m so happy to hear that. Thanks so much Tom. Hi Lindsey (or anyone who is a experienced cook), this sounds super delicious. I can’t wait to make it. I was just wandering though if I could use coconut oil instead of butter and almond milk instead of milk? and would these be in the same quantities? Sure! I would use them in the same quantities. Do you know or have you had any experience with freezing this? I’m participating in a soup exchange and have to take it frozen. Just made this on my snow day, and it’s SO good! I added garlic to mine though and it’s so addictive! Also, swapped regular milk for skim milk and it was still nice and creamy! Thanks for sharing this! I had no idea that kale and potato could work so well in a soup. I sauteed a few leeks that I had sitting around, and also added a couple garlic cloves lightly crushed. The soup is amazing. I had it for dinner last night, breakfast this morning with a piece of toast, and lunch today at the office. I made this last week and ate it every day for lunch. So delicious! And filling and healthy. And nobody said a word about the green color. DELICIOUS! I was looking for something simple to use up our kale after an exhausting day of gardening. Other than the mess I made when putting it into our blender, the recipe was a success. I omitted the milk because it was delicious and creamy before I added it. Thank you!!! We love hearing that! Thanks, Cory! This was really good. Thanks for sharing this. Top marks. Glad you liked it, Simon! My mom had a bumper crop of kale this year and seems to me bringing me a bunch daily. While I do love it, after eating the same sautéed kale night after night, we all needed something different. I found your recipe and made the soup last night…delicious!! Super easy and tasty. Even my picky 3 year old lapped it right up:) Thanks so much for the recipe, it’s one I will definitely make again. Two thumbs up ! How long would you say this lasts in the fridge? Hi, Lucy! I think this would be best when eaten in 7-10 days. Hope that helps! Hi, do you think this soup would work ok omitting the butter and using light olive oil,or rapeseed oil. Would you suggest same amounts if substituting – thank you. I think that substitution would be fine, and you can substitute at 1:1 ratio. I love your site but this soup was gross. The kale makes it bitter. Any suggestions for offsetting that? And the soup is almost too creamy – it needs some texture. Croutons maybe? Sorry to hear that. You could certainly keep some of the potatoes in chunks for texture, and topping with croutons sounds great! Maybe next time try making it with spinach if you didn’t like the flavor of the kale. Hope that helps! Made a huge pot and froze 2 batches in clip lock bags and reheated 1 batch last night, giving it a quick blitz with my stick blender and it was just as good. Such a simple recipe, full of taste. Thank you for sharing this recipe. Hi. So want to try the kale potato soup. Do you think subbing cashew milk could work for whole milk? We have a lactose intolerant in the household – ok, it’s me but I still want to try it. Hi, Merissa! I think subbing cashew milk would be fine. It may change the flavor slightly but the texture should remain the same. My whole family loved this! We sometimes do a fattier version of potato sausage and kale soup, but I love that my vegetarian daughter can eat this, and that it doesn’t include heavy cream. Just made this tonight and it was much thinner than I expected… I only put in around 5-6 cups of broth and 1 cup milk, so I can’t really imagine it with more liquid. I used the largest yukon gold potatoes I could find, but maybe they were smaller than the type of potato used in the original recipe. Came back to make sure I wrote the amount of ingredients down correctly… any ideas where I went wrong? Also, I simmered with the kale for right around 10 minutes but it didn’t puree in my Ninja as finely as it appears yours did. That said, I plan to make it again with a few adjustments. Thanks! I made this soup on Saturday just for myself so cut ingredients in half. I only used 2 cups of broth. I put most but not all of it in blender and it was thick enough without needing to even add milk. I just like more substantial soup is why I left some potatoes/kale whole, didn’t blend. To me, tasted delish! Glad to hear that, Merissa! Hi, Ruthie! Sounds like you did everything correctly. The consistency of the soup is largely based on the amount of potato in it, so next time maybe add another potato? Also, the smoothness of the puree could depend on how powerful your blender is. Glad you enjoyed it anyway! I tried to leave five stars but the system wouldn’t let me . Cold nights, even in Israel, and getting over the flu. I used your recipe but couldn’t help adding a bunch of leftover veggies I had in the fridge: 2 carrots, a stalk of celery with the leaves, a few sage leaves, and two large broccoli stalks which I saved (thinking of a situation exactly like this). My soup also came out just a tad thin, but I only had two potatoes on hand. It seems that this recipe could be used for any creamed soup and that’s why I love it. I might give it a try next time with pumpkin and sweet potatoes! Delicious and easy to make. Healthy too! Hoping you see this comment! Do you think this soup could go with subbing sweet potatoes for regular? If so, any other adjustments you would make to the recipe then? Thank you!! Fabulous soup, I added a large sweet potato as well, my husband really enjoyed it, as he is having trouble eating at the moment, so am making lots of nutritious soups, brilliant way of using up Kale. So thanks for recipe! Good to know that sweet potatoes work in this as well! Thanks, Vivien!